Ron Goldman is often the forgotten victim in the drama surrounding the OJ Simpson case. But his family will always have precious memories of their beloved Ron. 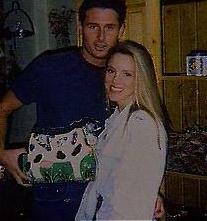 Goldman's sister, Kim Goldman, said, "My brother and I were like two peas in a pod. We were best friends." His loss won't soon be forgotten by those who loved him. She continued, "I would talk to him all the time, and I just can't believe he's not here anymore." Goldman's life was tragically cut short when he and Nicole Simpson were stabbed to death outside her condo on June 12, 1994. Kim says of the tragedy, "I would never wish on anybody what has happened to my family. But I wish to God it hadn't happened to my brother. He was too young and he didn't even put his foot in the door." Goldman's father Fred tried to put his son's life in perspective saying, "It's hard to imagine that your flesh and blood, your 25 year-old, had a chance to touch so many people." During his short life, Goldman blossomed from a shy youngster to an outgoing young man who lived a California lifestyle: surfing, playing volleyball on the beach, weightlifting, enjoying tennis matches, and playing on a baseball team." A player on Goldman's baseball team commented, "He was an inspiration to the team and an inspiration as a person." And another: "He was the one of the most wonderful, loving, giving people that I have ever known." Goldman worked as a waiter in trendy restaurants and occasionally worked as a model. And his Kim said he had greater goals (99k aiff). "My brother was a big-hearted, down-to-earth, hard-working, goal-oriented person who wanted to get married, have a family, and be successful. Down the road, he wanted to open a bar." Goldman got a brief glimpse of showbusiness when he appeared on the now defunct TV show 'Studs." When the "Studs" host asked: "Ron, How would you rate yourself on a scale of 1 to 10? ", Goldman replied playfully, "Well, on my scales I would be way up there." Goldman's friends say women liked him but would break his heart. Jacqui Bell and Goldman dated for a year and a half. She said Goldman wanted a commitment, but she didn't. She broke off their relationship three months before his death. She remembered how warm and affectionate he was saying, "He'd always be there with a rose or have a candlelight dinner laid out on the floor when I got home." A few months before his death, Ronald Goldman met a beautiful blond, Nicole Brown Simpson, who let him drive her Ferrari. Goldman told coworkers they were only friends. Kim believes their relationship was platonic, despite popular opinion. She explained, "It's part of society to think everyone is sleeping together, and that a man and a woman can't be friends." According to prosecutors, it was this friendship which caused Ron Goldman's death. They say he arrived at Nicole's condo to drop off glasses that were left at the restaurant by her mother, and then became an innocent victim, arriving at the wrong place at the wrong time. Friends are still in shock: "You think it's a bad dream and then you realize that you're never going to see him again." Fred Goldman mourned: "He was a special human being. He didn't deserve what happened."